The utility boxes that line the city's streets have always been about function, not form. The squat, plain gray boxes house electrical components for things like phone lines and traffic and street lights, sporting an aesthetic that matches their utilitarian purpose. But the Boston Art Commission, in conjunction with Boston Shines and the Mayor's Office of Neighborhood Services, has plans to spruce some of them up. Through a program called PaintBox, launched last weekend, the city has invited neighborhood artists to treat the boxes as their canvas. According to Karin Goodfellow, staff director for the Boston Art Commission, artists will be working through October to decorate 10 boxes in neighborhoods like Codman Square, West Roxbury, and the South End. Goodfellow hopes the project will deter taggers who've targeted the boxes for their graffiti. The boxes "get tagged a lot," she said. The program is not only an opportunity to brighten up the boxes with public art, but also a chance to introduce neighbors to the artists who live among them, Goodfellow said. "It makes you proud to be a Bostonian," said Charlestown artist Aimee Empey last weekend, as she worked on the inaugural painted box. "People come out and say, this person is from my neighborhood, look what they've contributed." Chosen as the kick-off artist for PaintBox, Empey, who declined to give her age, is a full-time mixed-media artist and interior designer with a studio in Charlestown. She worked for about 18 hours last weekend on her box, at the edge of the harbor on a wooden dock near Christopher Columbus Waterfront Park, where the city's annual Boston Arts Festival was taking place. Barefoot and wearing overalls covered in paint, Empey moved back and forth, surveying her work. "I would do anything for public art," she said, before adding sunbeams to the picture. 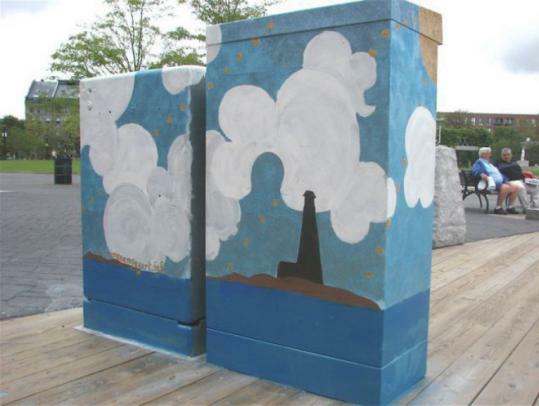 Empey said she spent a few days thinking about how she wanted the utility box to look, settling on a light blue sky covered in white fluffy clouds and a golden sun beaming down on a lighthouse. Over the paint, she glued corresponding colors of glitter. "I'm from the Cape, and I thought this [location] was a great junction of Boston and the seaside." The commission invited local artists to submit applications and sketches to participate in PaintBox. There are no strict guidelines for the artists, according to Goodfellow, except that they must use a lighter color palette - darker paint could cause the utility boxes to overheat. Goodfellow said the response from local artists has been overwhelmingly positive. "We've received really nice e-mails and positive feedback, she said. "It's great because we're doing something public and fun." Goodfellow said the commission doesn't know if the project will grow beyond the initial 10 boxes, but that neighborhood feedback is helpful in determining the future of PaintBox. Empey said she hoped the program would continue, because it helps build the city's artistic reputation and gets artists out of their studios and into the streets. "Right now, there's not enough [public art]," Empey said. "We're just starting to promote the area and starting to show what we have. I am happy to see local artists come out and be appreciated." Kimberly Sanfeliz can be reached at ksanfeliz@globe.com.